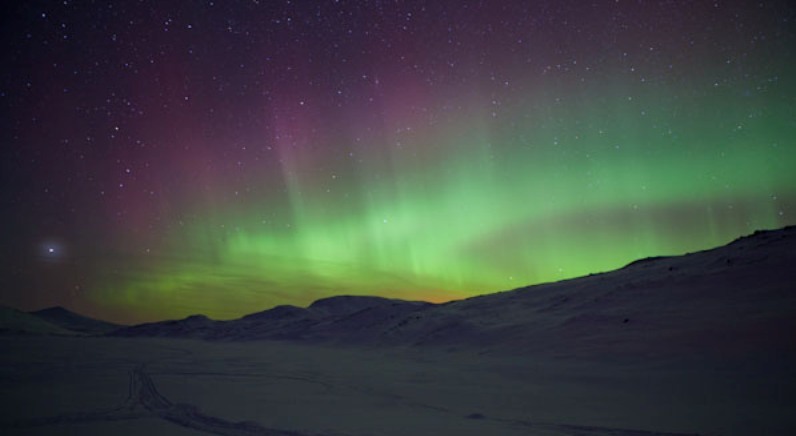 wolverine and musk ox roam wild and free. One day will be devoted to visiting the Rogen Nature Reserve where we will come into contact with the last survivor from the ‘ice age’. 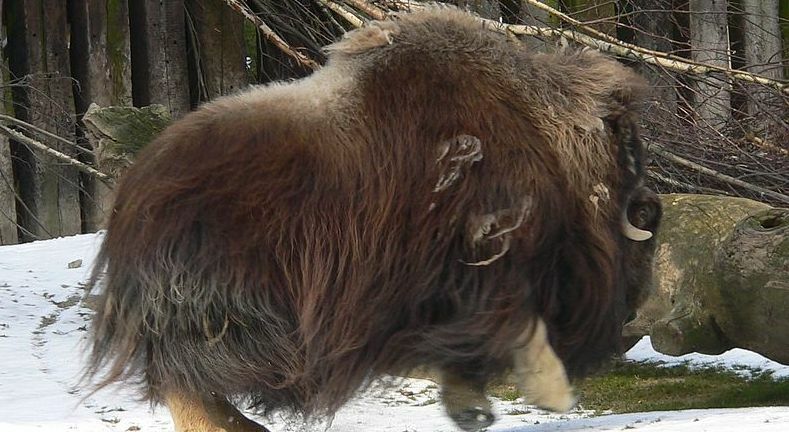 The musk ox was introduced into this ‘Harjedalen region in 1971 and is regularly monitored by veterinarians and researchers working for its preservation. This type of holiday does not require any special skills but only a predisposition for outdoor sports, a love for nature and especially the desire to see it and experience it with your own eyes. It may be a surprise to you that in this land, which is both loved and feared for its icy cold, thanks to the low percentage of moisture in the air, we have a much higher ability to withstand the cold, which feels nothing like Mediterranean ‘cold’ temperatures where the very high percentage of moisture in the air makes us much more sensitive to very low temperatures. After breakfast, meeting with the guide and a brief introduction to the holiday.We are in Norwegian territory near the mining town of Roros which is of great historical and cultural value. Being outside the normal tourist destinations makes these locations places where you can experience a genuine contact with nature. Our adventure begins a few miles from Roros on a farm where we will meet our musher who will start sharing the secrets of the magic world of dog sledding with us. 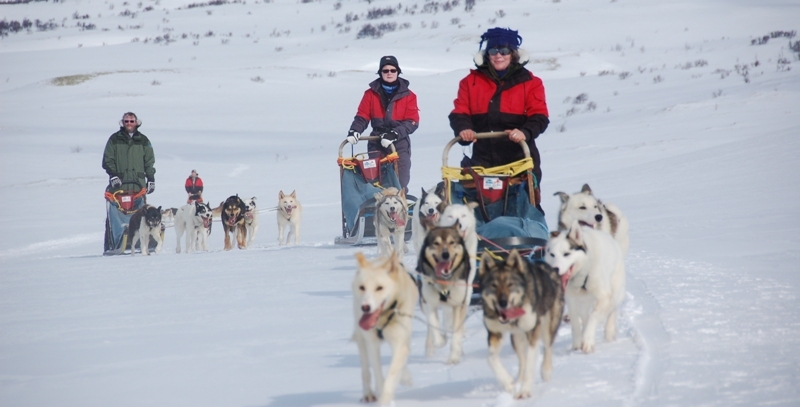 You will be supplied with extra clothing and given your first lessons on how to maneuver a sled. The start of this adventure is always very exciting, you will experience the unique pleasure of a connection, which you establish from the very beginning, between yourselves and the beautiful dogswithin a stunning environment. 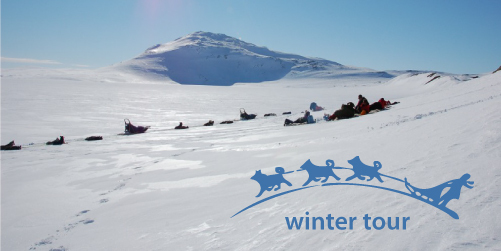 Each participant will have their own sled and a team of dogs that magically transports him or her into another dimension. You are experiencing a life described in the ancient tales from the Far North when men and animals lived together in harmony with nature.The path winds across the Arctic tundra – on certain days temperatures reach minus 25 degrees below zero – the snow looks crystal clear and on sunny days, in the blinding light of the North skies, the path takes us through forests interspersed birch trees bent double by the snow and the wind. The journey takes approximately two and a half hours. We stop for a break and to warm up, with a nice hot coffee and some Norwegian biscuits specially prepared for the occasion. Then we resume our journey along other exciting paths before returning to our base for a little relaxation. 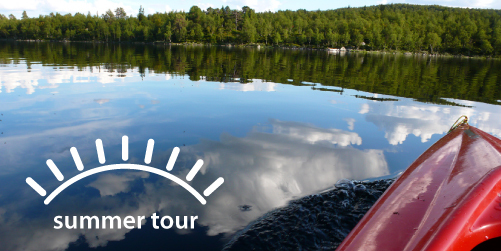 Before travelling to the Swedish border (approx 50 min) we will stop in the town of Roros. In this lovely village it seems as though time has stopped still. In times gone by, the miners built their fortune on this land, which is rich in copper, and thanks to the generosity of the owners of the mines it was easy to obtain land on which to build houses, raise families and graze animals. For this reason, the town has not lost its original ‘rural’ feeling over the years. When wandering through its streets you can still breathe in the scent of fresh wood, open fires, and the smell of the hay and horses which are still kept in traditional barns built next to the houses. along this road did so in order to reach the remote mining town and its town market, where they could exchange products and have contact with other human beings following a long lonely winter in the wild. The horses along with the sled dogs were a valuable asset for our ancestors – they were essential for their survival. After a short while we have the border in sight – we see a small transit station – but still it is nature’s silence which rules the land. Have you ever walked on the moon? This is the what it feels like when you step off the snowmobile and crunch your feet onto the ground into the ice and snow that permeates the plateau, where in the summer it is full of breathtaking lakes and waterfalls. Endless expanses of snow drifts that resemble sand dunes in the desert stretch as far as the eye can see. Here the temperatures can reach minus 30. On sunny days the ice sparkles like crystal and one has the impression of being immersed in another time and space. 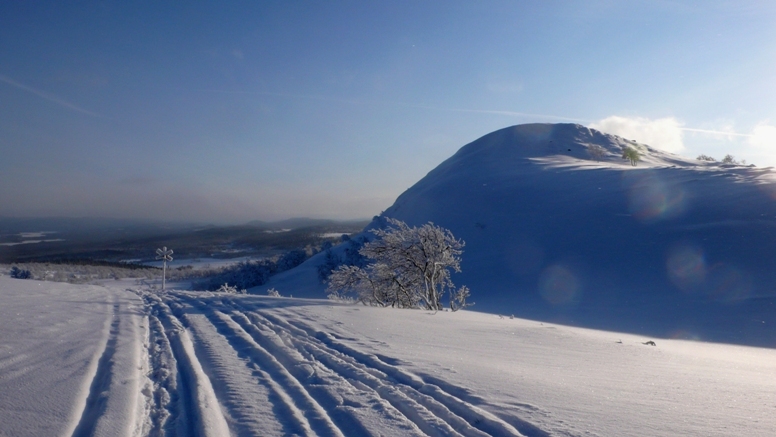 We reach this plateau by snowmobile and weather permitting we will stop and stay in a stuga – a traditional Swedish house – where we will light the stove and eat by candlelight. 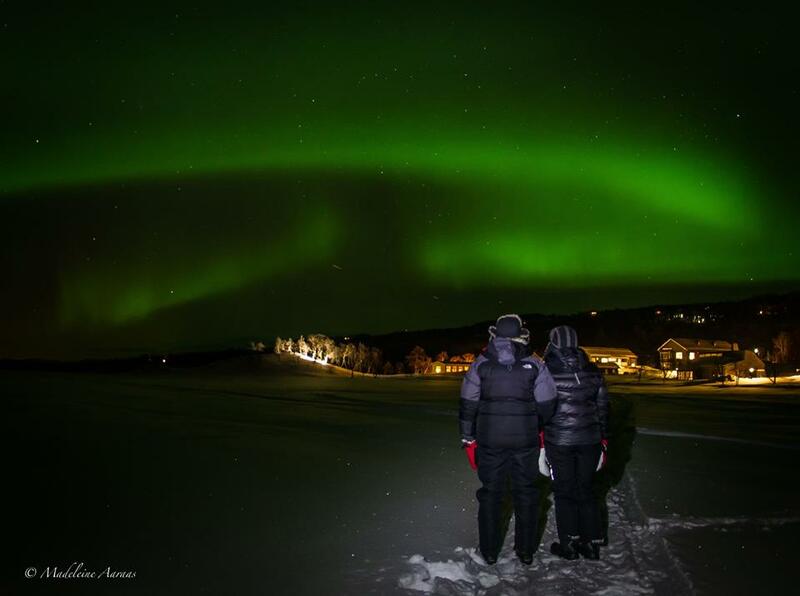 Using snowshoes we can go and search for a glimpse of the Aurora Borealis. This photo was taken by our customers last year in the month of January. The musk ox is the only animal alive today which witnessed the last ice age – which took place 10,000 years ago. These animals, thanks to their thick skin and fur – 12 layers – have managed to cope with the extreme temperatures over the years. They were considered sacred at one time by the people of the Sami, but unfortunately over time, due to changes in climate and unscrupulous hunters they have reached a risk of extinction. Part of this day will be devoted to them and to the Rogen Nature Reserve – 500 kms of pristine unspoilt wilderness. 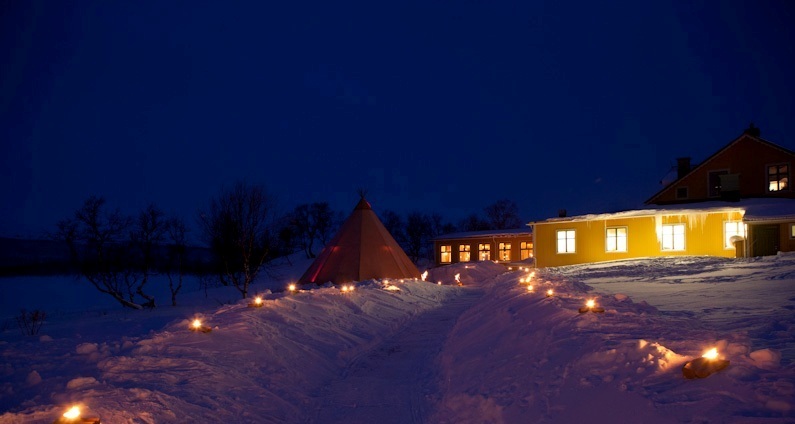 Return to the hotel – Sauna – dinner and overnight. We call this former mining village a ghost town, it is located on the edge of a huge lake surrounded by birch trees and golf courses. When you stand on the town’s bridge, with the rushing waterfall above it, all you can hear is the thunderous noise of the water cascading powerfully to the ground.People still live in the local area, but now they are mostly local craftsmen who work with wood or farmers who live and work in this place of beauty and absolute peace, where silence reigns supreme. We travel along in almost a religious silence, listening only to the ebb and flow of nature itself. Short break – coffee or hot chocolate. Return to the hotel sauna, dinner, overnight stay.